Indian Overseas Bank (IOB Bank) is a major Chennai based public sector bank. Indian Overseas Bank (IOB Bank) has about 3400 domestic branches including 1150 IOB branches in Tamilnadu. If you owned saving and current bank account in Indian Overseas Bank then you use this facility to check your IOB bank account balance and mini statement on the go. 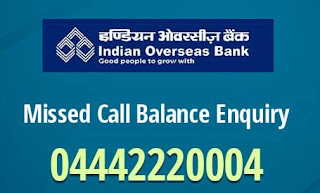 To avail IOB missed call balance enquiry facility, your mobile number should register with Indian Overseas Bank. If your mobile number is not register then you can visit nearest Indian Overseas Bank, Fill a KYC form and update your mobile number with IOB. 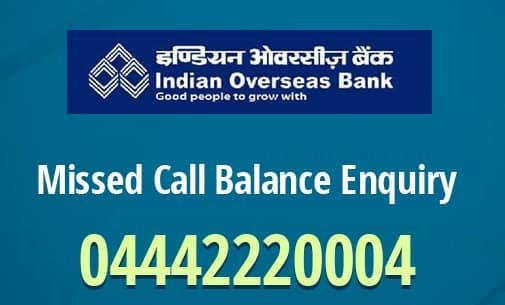 If you want to know Indian Overseas Bank Toll Free Customer care number for Banking, Loan, Credit Card, ATM Card, Debit Card, Complaints etc. Click here to know.